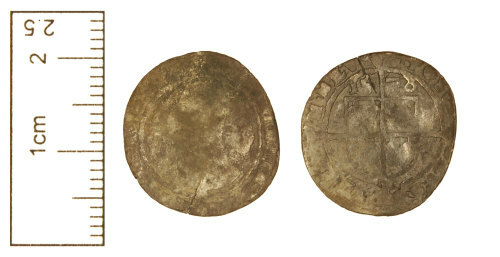 Silver threepence of Elizabeth I AD 1558-1603. The coin does not appear to be clipped, but is slightly misshapen. The obverse shows a crowned bust left, with rose behind. This area of the flan is very worn. Obverse legend reads [..]BETH.DG.ANG.FR.HI. Obverse legend should read ELIZABETH.ANG.FR.ET.HI.REGINA. Reverse shows shield showing royal arms with long cross fourchee over. The date of 1578 is present above the shield. Reverse legend reads POSV[./.../..]MMEV. Reverse legend should read POSVI.DEV.AD.IVTORE.M.MEV. Die axis is, 6 o'clock. Weight is 1.2g. Diameter is 1.8mm. Thickness is 0.6mm. Spink and Son Ltd, 2011 Coins of England & The United Kingdom, 46th Edition London: Spink and Son Ltd p,251. NO,2573. Obverse description: Crowned bust left, with rose behind. Reverse description: Shield showing royal arms with long cross fourchee over.